The Old Town Music Hall now has a new and improved projection system that replaces their old projector which had an untimely meltdown. The picture quality of the new projector is truly spectacular. Now, they need to raise $5,000 to help cover the cost of this unexpected snafu. If you’re able to pitch in, please CONTRIBUTE at: oldtownmusichall.org/contribute or mail a check to 140 Richmond Street, El Segundo CA 90245. You can earmark your generous offer for the projector fund — and as always, the donation is fully tax-deductible. Their operations are not supported by ticket prices alone. They rely on the generosity of friends like you to support our weekly programming and concerts, and to maintain the Mighty Wurlitzer and the Bösendorfer concert grand piano. They THANK YOU for your ongoing support in keeping this non-profit theater alive. Old Town Music Hall is a 501(c)(3) non-profit organization. Your donation is fully tax-deductible as allowed by law. Theatre, film, and television actor, Sir Donald Sinden, has died at his home following a long illness. He made his name on stage as a Shakespearean and West End actor, and he appeared in more than seventy cinematic and small screen productions. Although renowned for his live work, he was arguably best known for his roles in the sitcom Never the Twain and the BBC legal drama Judge John Deed. Sir Donald trained at the Webber Douglas Academy of Dramatic Arts in London. He was the last person living to have known Oscar Wilde’s lover Lord Alfred Douglas, and was one of only two people to attend his funeral. In 1949, Sinden appeared in The Heiress at the Theatre Royal, Haymarket opposite Ralph Richardson and Peggy Ashcroft, and directed by John Gielgud. Achieving early fame as a Rank Organisation motion picture star in the 1950s, he was notably cast in Mogambo (the remake of Red Dust) and The Day of the Jackal. 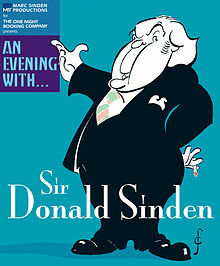 Sinden was appointed a CBE in 1979, and then knighted in 1997 for his services to drama. He celebrated his 89th birthday, and his retirement after thirty years as the longest-standing President of the Royal Theatrical Fund (founded by Charles Dickens in 1839) with a celebration lunch for 350 guests at the Park Lane Hotel. Leading the tributes was film star Jean Kent, letters from Queen Elizabeth II and Prince Albert of Monaco, and a speech from Julian Fellowes. The Society of London Theatre has announced that the West End will dim its lights in the actor’s memory. Sir Donald Sinden was 90. This entry was posted on Saturday, September 13th, 2014 at 12:03 am	and is filed under Blog by Manny Pacheco. You can follow any comments to this post through the RSS 2.0 feed. Responses are currently closed, but you can trackback from your own site.